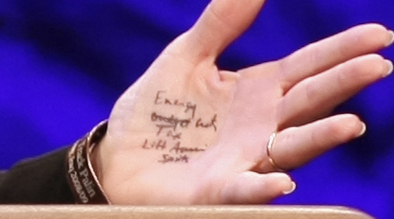 With everyone talking about Sarah Palin’s crib notes on her hand, I would like to present The Top Ten Things Written on Sarah Palin’s Hand (after passing them through a spell checker). I know this is a lot of stuff to fit on a hand, but Palin has practice at this. After all, this is how she passed her tests in college. Posted in Humor and Satire, Sarah Palin. Tags: Deficit, Republicans, Russia, Sarah Palin, Socialism, Taxes. RSS feed for comments on this post.. TrackBack URL. On par with Letterman! VERY good! WHO CROSSES OUT STUFF ON THEIR HAND???? Palin is dumb as a brick. 11. Be sure to wink. I am NOT a Palin supporter. But I think she crossed out the word budget so that, in her mind, it would remind her of ‘slashing the budget’. Of course, she hasn’t any policy proposals. Just talking points so jumbled they don’t even make sense. $$arah is a sick puppy. In is a tragic and unfortunate circumstance when comments such as those above are made. Palin has the grace and dignity to not enter into a battle of wits with those persons. She simply will not fight with unarmed people. I am confused. Is moderation censorship? Where are my comments anywhere as insulting and dis-respectful of civil speech that the ones I have read in reply? Do you even listen to what Palin says? Her speeches bring politics into the gutter while she avoids saying anything of substance, and shows absolutely no understanding of current issues. She tries to enter a battle of wits but even a rock is better armed than her. Jerry, I think you like word salad a little too much. Too bad it doesn’t make a bit of sense. No, moderation is not censorship. Do you have any concept of private property? Blogs, like newspapers, are the property of their owner and we have full say in what letters and comments are posted. That is in no way analogous to government censorship? Both liberal and conservative blogs routinely moderate comments. Moderation also means there will be a delay until comments are reviewed, not whether the comment will be posted at all. 1) Obama has lowered taxes, not increased them since taking office. Bush only wanted to give a tax cut to the ultra-wealthy. It is the Democrats who forced the addition of a middle class tax cut. 2) The goal is to improve education. Obama’s education policies have even been receiving praise from many conservatives (at least those with integrity as opposed to those who attack anything regardless of merit). That said, it is true that some Democrats are overly influenced by the teachers’ unions just as many Republicans are in the pocket of undesirable groups such as the insurance industry. 3) That is what the religious right does, and that is why liberals are so opposed to the authoritarian right. 4) It is conservatives who base their policies on ideology, ignoring both common sense and the facts while liberals base policies on both common sense and facts. 7) Another false claim. I’ve been critical of both Chavez and Bush–seeing both as a threat to both civil liberties and the free market system. 8 ) No, again that’s the conservative view. Here’s a simple explanation of the differences: Liberals believe in increasing personal freedom. Conservatives use government to impose their views upon others. Support for individual liberty and reality-based policies (as opposed to ideological and religious-based views) are the fundamental ways in which liberals differ from conservatives. 9) Again false. Many liberals believe in god and some do not. Regardless it is liberals who support freedom of religion while it is conservatives who use the power of government to impose their religious views upon others. 10) Again not a view held by liberals. Liberals do not believe life should be risk free. Some Democrats have been overly protective of the trial lawyers, but again this is a problem with politics that each party has its supporters which they look out for. Obama has stated a willingness to include tort reform in his health care plan. There is some support for tort reform in the Senate bill and far more would have been done if Republicans had been willing to work with Democrats as opposed to deciding they would vote against anything proposed.